Crows can usually take care of themselves. They’re smart enough to drop nuts onto roads or other hard surfaces to crack them open and expose the food inside, and to use leaves as tools to extract insects from their hiding places. Even so, when crows are orphaned or during very hard times when no food is available, they can use a little help finding something to eat. They aren’t hard to feed; crows will eat almost anything. Very young crows need a soft diet with plenty of protein that simulates what they’d get from their parents. Feed them a mix of oatmeal, hard-boiled egg yolk, dog food, cat food, baby cereal and raw beef heart or kidney. Include some good bird vitamins and crush a few eggshells to add to the mix as well. Soak or chop everything, and then feed it to them from the end of your finger. As the youngsters get older, start giving them some of the foods that adult crows eat. Most orphans can feed themselves by the time they’re about 6 weeks old. Wild crows eat all kinds of nuts. They will eat almonds, acorns and walnuts, along with any nuts common to your area, typically flying off to crack them open. You can make it easier for them by offering shelled nutmeats or unsalted peanuts, which they can open easily. As opportunistic feeders, crows take advantage of whatever is around. They’re well known for raiding gardens and cornfields, eating any foods they find. They’ll normally consume anything you offer, such as cracked corn, pumpkin seeds, sunflower seeds and rolled oats. Crows generally will accept any grain, including millet, milo and wheat. In winter, mix seeds or grain with beef fat to create suet, a high-energy food. 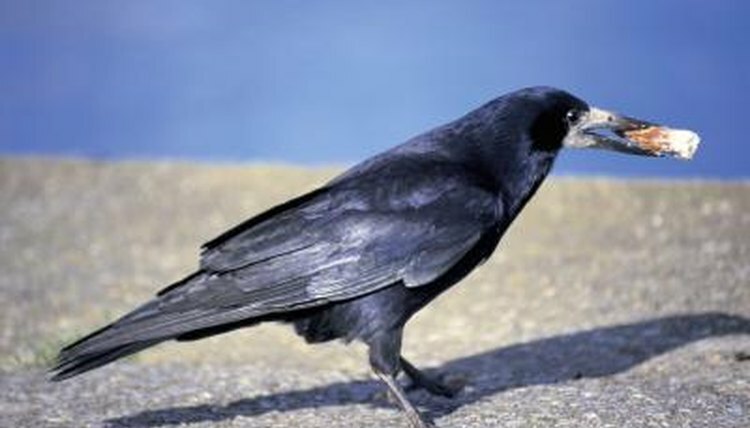 On their own, crow eat frogs, lizards, insects and anything else they can catch and swallow. They’re also known to eat carrion, but you don’t need to offer them such variety. Feed crows mealworms, crickets and mice. They also like fresh fruit if you have it. A simple way to feed them is to put out dog or cat food that’s in small pieces, no bigger than peas. Adults don’t need to have it soaked first like baby crows do, but if there’s water nearby you might see them dunking their food before they eat.